I have used this company for years and always satisfied with their excellent quality. Works perfect for me. Service Vest is top quality, fits perfect. Got my service dog tags quickly and accurately. Second time I have used them, and this time was easier than the first and the price is fair. I always use this company for many reasons. Professional, Trustworthy, and sends out your tags immediately. They give you up to date information that can assist you as well. Just what we wanted. He goes everywhere with us and truly calms me in certain situations - also gives us peace of mind jic he gets away :( Was recommended by a flight attendant as well as a nurse in our Vet's office. If it was a little smaller it would fit him better but we only use it when we know it will be needed, so it's fine. Great quality, love having one for my wallet too. Thank you for providing this service and product. 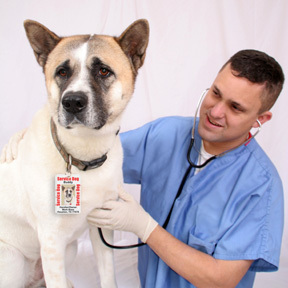 The Service Dog ID tags were of high quality and very well done. Easy to attach to bags and collars and easy for business owners to view them. Click the button below to add the Service Dog Tag Set for Small Dogs (3 Sm, 1 Lrg) to your wish list.